A while ago I stumbled across this image (which I recreated and cleaned up a bit). It’s a beautiful image. 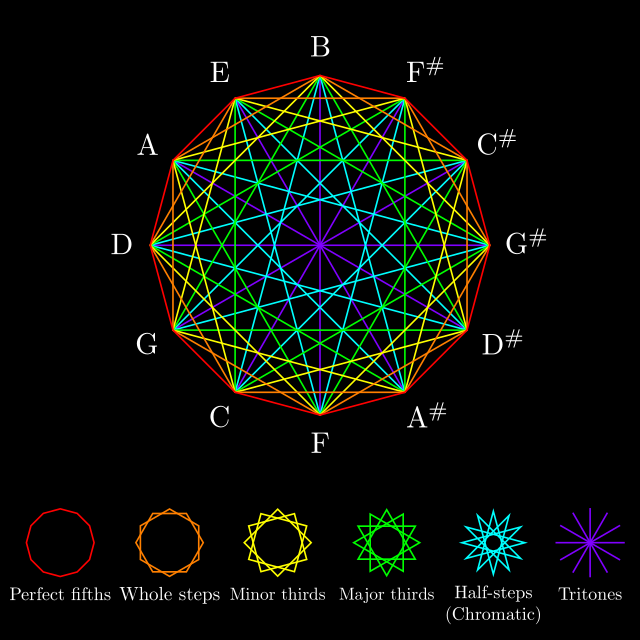 Arranged around the edge is the circle of fifths, which in music is a geometric representation of the twelve tones of the Western scale arranged so the next note is seven semitones up (going clockwise in this figure). 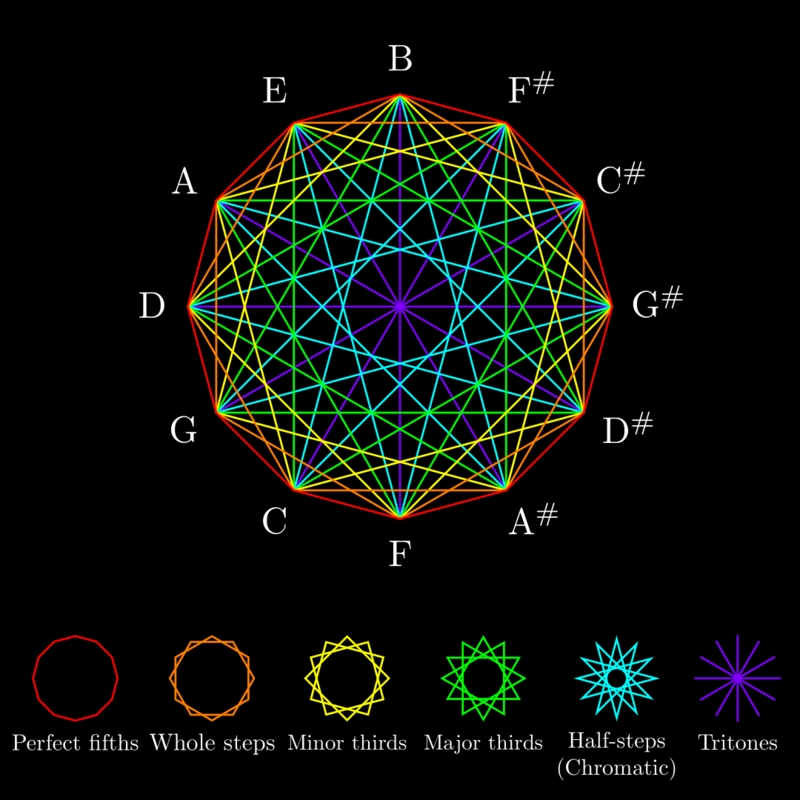 The notes are all connected in six different ways to the other notes in the “circle,” known as intervals, which are color-coded at the bottom. I thought, “Wow, this is a really cool way to represent this geometrically. How neat!” However, I found the original website that the image came from, and it’s a pseudoscience site that talks about the fractal holographic nature of the universe. While fractals do show up in Nature a lot, and there are legitimate theories1 proposing that the Universe may indeed be a hologram, what their site is proposing is, to put it lightly, utter nonsense. But instead of tearing their website apart (which would be rather cathartic), I instead want to point out the cool math going on here, because that sounds more fun! Looking at the bottom of the graphic, you’ll notice six figures. The first (in red) is a regular dodecagon, a polygon with twelve equal sides and angles. This shape is what forms the circle of fifths. The rest of the shapes in the sequence are dodecagrams, or twelve-pointed stars. The first three are stars made up of simpler regular polygons; the orange star is made up of two hexagons, the yellow is made up of three squares, and the green one is made up of four triangles. The final dodecagram (in purple) can be thought of as made up of six straight-sided digons, or line segments. These shapes point to the fact that twelve is divisible by five unique factors (not including itself): one set of twelve, two sets of six, three sets of four, four sets of three, and six sets of two! 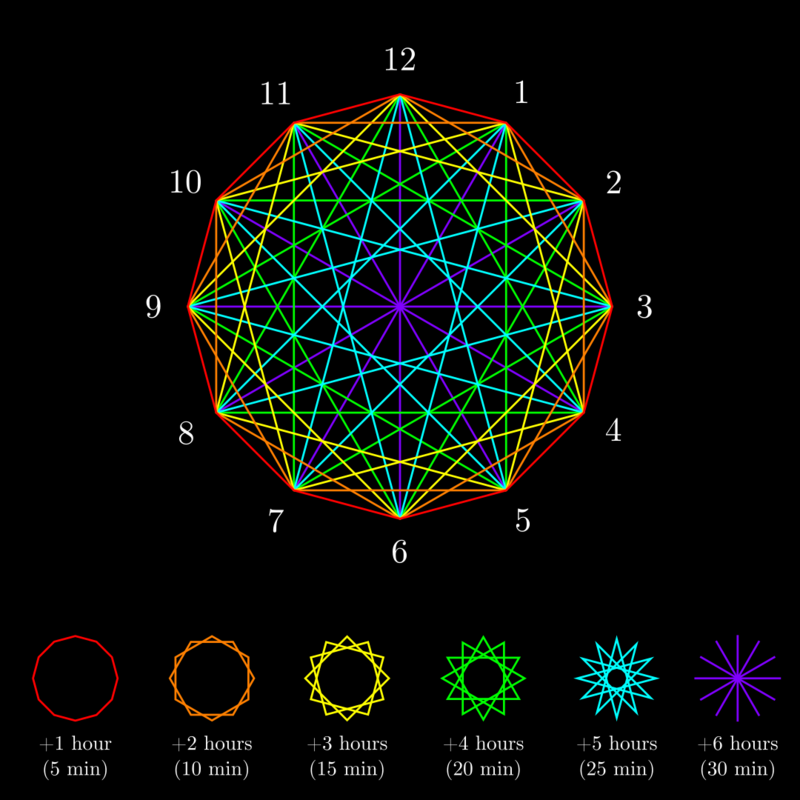 You could say that the vertices of the dodecagon finalize the set as twelve sets of one, but they’re not illustrated in this image. So really, this image has less to do with musical intervals and more to do with the number 12, which is a rather special number. It is a superior highly composite number, which makes it a good choice as a number base (a reason why feet are divided into twelve inches, for instance, or why our clocks have twelve hours on their faces). The final dodecagram in cyan is not made up of any simpler regular polygons because the number 12 is not divisible by five. If you pick a note in the circle of fifths to start on, you’ll notice that the two cyan lines that emanate from it connect to notes that are five places away on the “circle,” hence the connection to the number 5. In fact, it would be far more appropriate to redraw this figure with a clock face. where the notation in parentheses is “n choose 2,” and is a triangular number. 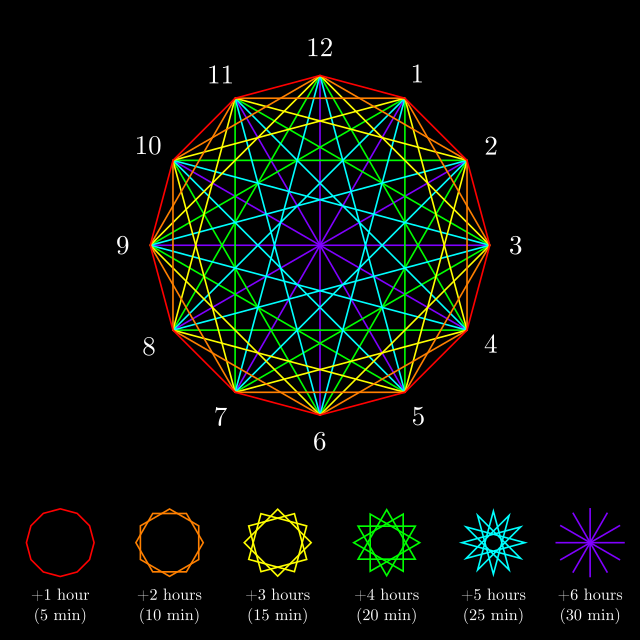 This figure is known in math as , the complete graph with twelve nodes. And it’s gorgeous. So while this doesn’t really have anything to do with music or some pseudoscientific argument for some fancy-sounding, but ultimately meaningless, view on the universe, it does exemplify the beauty of the number 12, and has a cool application to the circle of fifths.